Samsung's website showing how much trade-credit each trade receives from the manufacturer. This past week we told you about a couple of Samsung sponsored deals that that did not live up to their promise. We mentioned how one BOGO participant purchased a Samsung Galaxy S8+ for full price and was supposed to get a free Samsung Galaxy S8 within 1 to 3 business days. Instead, the second free model has been placed on back order. With the other deal, Samsung promised a $200 credit toward the purchase of the Samsung Galaxy S8 or Samsung Galaxy S8+ to anyone trading in a phone in working condition. Some taking advantage of this deal said that Samsung was refusing to give some consumers the full trade-in value of $200 by sending them the bare minimum of $25 for trades that were obviously worth a lot more. For example, one loyal Phone Arena reader wrote us today to explain how he received only $25 from Samsung for his mint condition LG K8. To refresh your memory, Samsung said that to be given the full $200 credit, the phones traded in need to work, have a screen with no cracks, and must hold a charge. According to Samsung, this fellow's trade did not not meet the criteria for "normal wear and tear." As a result, he was charged $175 which reverses all but $25 of the original $200 he received toward the purchase of the Galaxy S8 or Galaxy S8+. While promoting the deal in its website, Samsung graphically illustrated that certain Galaxy models were worth as much as $350 with a trade-in. The last image was titled all smartphones and showed that trades under this too broad of a category were worth $200. To make matters worse, once a phone is traded in, Samsung will not return it under any circumstances. That means in a case like this, Samsung's word is final. But Samsung isn't totally wrong. What might have happened here is that Samsung got tired of handing out $200 credits for cheap trade-ins. The LG K8 is priced at about $50 at Best Buy for Verizon's pre-paid plan. 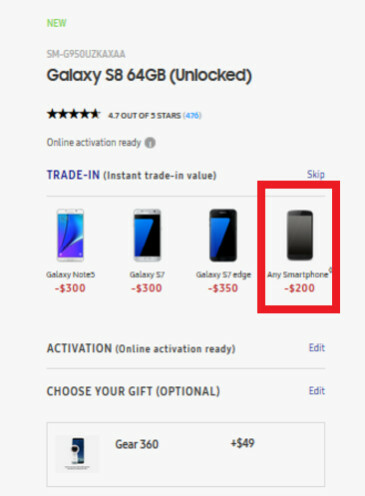 To avoid this in the future, Samsung needs to be more specific about the kind of phones that will receive full value in a trade-in promotion instead of using the vague "All Smartphones" category. I'm surprised that they even gave 25 $ . I think they went overboard with their generosity. There isn't at all. This is why that Samsung is justifying its miserable action with silly reasons like didn't meet the normal wear and tear. They basically cheated on many customers and enticed them to buy their laggy S8 "on the so-called discounted prices, as usual. You've got your tinfoil hat on... I see. No trojan_horse, Rafishant is right. There was nowhere on the website that pointed to terms and conditions. This is why people are upset. How do I know? I legitimately was about to purchase one and looked everywhere on the website for restrictions. There were absolutely ZERO with exception that the phone had to be working, and be in pretty decent shape. There is NO defending Samsung here. What they did is cruel. Charging consumer's credit cards without warning for simply doing what they allowed is criminal on Samsung's part. WOW you really are a idiot. You said to makerk to read HIS entire post. I am letting you know I am not a he. Does sissy246 would like a HE name. His (presuming you're referring to LebronJamesFanboy) entire comment was based around the following: "There was nowhere on the website that pointed to terms and conditions." Which is completely false as pointed out by comment #32. Him not seeing it doesn't mean they don't exist. That's due to the negligence of his eyes, not Samsung as he desperately tries to imply. I meant to type "ACTUAL" terms and conditions, which the rest of my comment alluded to. I don't qualify the stated terms and conditions as legitimate, especially when people do EXACTLY what it said to do and end up with a $175 charge. The point is the terms and conditions were met by what this man did and some of you are defending Samsung like biased fools. The handset that man sent in was of a much lesser value than the $200 credit he expected... So he received his what his handset is worth. Are you lacking so much in commonsense? You can't trade a $50 phone and expect $200in credits... Samsung's terms and conditions was clear on trade in value: You'll only get what your trade in handset is worth!!! And the minus sign before $200 indicates that Samsung is only willing to give $200 or less... So, if your handset is worth more than $200, then simply do not trade it in. From the terms and conditions "Trade-in value is based on the particular model device you select as your Trade-In Device as well as which device you are purchasing" Tells it all for me. In other words if you go buy a $50 phone you are going to get that phones value. Except that's along with the "minimum $200" statement. Meaning, you'd be looking at $200 minimum credit unless it was worth more, or busted. Samsung claimed $200 minimum, then left absolutely everything to their own discretion, in the fine print, by not listing acceptable phones. Which is why i posted in the original article about this sale, that people should be careful. HTC did this to me when they also had a "minimum $200 credit" promo and i sent in a perfectly working and unlocked tilt 2. "The phone doesn't power on so you wont be getting anything or the phone back but thanks for your business, sucker!" Was basically the email i received a week after sending it in. "Except that's along with the"minimum $200" statement." No! The minus sign right before the $200 indicates that anyone trading will receive $200 or less in credit for a Galaxy S8. And terms are pretty clear. The trade-in credit you get is based on the value of the phone you're trading in. And You can't trade in a phone worth $50 and expect a $200 credit. The only thing I blame Samsung for, is that Samsung does not return the phones which are not eligible for a trade-in credit back to their owners, but Samsung instead keeps them... Why? That is creepy. I do agree to a point. I also understand why they are not. Overseas shipping is high and they would be ratting a lot of money shipping them back even though I am sure the get a discount on shipping it would still be expensive. Lmfao that is the credit samsung is offering off of the price of the new device. Hence why the digits are also in red. It was marketed as a "$200 minimum credit" deal. It's not "$200 or less". You honestly got a chuckle out of me, ill give you that. Reddit has a thread where people list what did and didnt make it through for the $200 credit, and there is absolutely no sense to it. Some $10 pixis made it through and some $150 xperias didnt. It was all up to samsung. "You cant trade in a phone worth $50 and expect a $200 credit" You can if that's what is offered. Which it was. Again, this was always offered as a "get minimum $200 credit" deal. Not defending scammers but samsung couldve prevented all of this by simply stating which phones they would and wouldn't accept for the $200 credit instead of being vague. "What condition does my device have to be in in order for me to trade it in? In order to trade in your device, it must meet the following conditions: · It cannot be on a black list of any kind; · It must be able to be powered on; · It can only be in a condition consistent with normal wear and tear; · It cannot have a cracked screen; and; · It cannot have any water damage of any kind What if Samsung determines that my device does not meet the minimum conditions? We will evaluate your device when we receive it, and if it does not meet the conditions described above, we will value it at $25 and charge you the difference between $25 and the amount of the trade in value that was applied to the purchase of your new Galaxy Smartphone. If you do not send Samsung your device within 15 days of receiving your new device, Samsung will charge you the full amount of the trade-in value that was applied to your purchase. Please note that your old device cannot be returned to you." Nowhere on there does it exclude any device. And seriously dude, it was never $200 or less. No one got $100 or $150 or $175 etc. because it was either $200 or $25 as per the stated terms. Any new phone should have met the requirements for $200 credit. This is exactly right. I figured it was sort of like the similar offer Verizon was doing ($200 off) when the iPhone 6 was released. Verizon listed specific models that were eligible, whereas Samsung was very open ended. The original offer expired on 6/25 after which I think they changed the language and eliminated the open-ended "any iOS or Android phone" deal. Companies who advertise promotions should have to honor the terms of what they advertised. They still haven't shipped my phone because they are so far back ordered due to the extraordinary deal they extended. If you don't plan to honor a deal then don't offer it! "The minus sign right before the $200 indicates that anyone trading will receive $200 or less in credit for a Galaxy S8." How do you figure that? Maybe if it said "$200>= Off" -$200 means exactly that. Minus $200. Either subtract $200 or add negative $200, the result is the same. If you read the whole terms and conditions it tells you exactly what you need to know. Most people just read the first part I bet and not the whole part and that is their fault for not reading everything. Also if you don't understand it then let someone read it that does. I read the whole thing and clearly understand that if you sent a cheap azz phone in you are not going to get $200.00. If that's what you understood, then your reading comprehension skills are terrible. It was a minimum credit deal, with max being market value of your device. Which is where the part you quoted comes in. Unless the device didn't meat their specific terms, which i quoted on the other post, then youd get $25. No one got any credit for less than $200, other than the $25 recycling credit, because that was never an option. If you sent in a brand new moto g that wasnt accepted, you didnt get the $100+ credit for what it's worth. You got $25 and a BS excuse about something being wrong with the device.